One of the places most seriously affected by the use of white phosphorus was the main UN compound in Gaza City, which was hit by three shells on 15 January. The same munition was used in a strike on the al-Quds hospital in Gaza City the same day. Under review by Colonel Shai Alkalai is the use of white phosphorus by a reserve paratroop brigade in northern Israel. According to army sources the brigade fired up to 20 phosphorus shells in a heavily built-up area around the Gaza township of Beit Lahiya, one of the worst hit areas of Gaza. 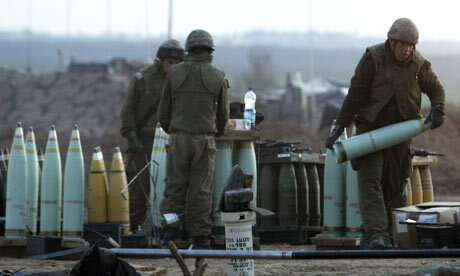 The internal inquiry – which the army says does not have the status of the full investigation demanded by human rights groups including Amnesty International and Human Rights Watch – follows weeks of fighting in which Israel either denied outright that it was using phosphorus-based weapons, or insisted that what weapons it was using “were in line with international law”. Phosphorus is a toxic chemical agent that burns on contact with air and creates thick white smokes in order to hide troop movements. However phosphorus shells are largely indiscriminate scattering large numbers of fragments over a large area, which can cause severe damage to both human tissue and property. As the Guardian reported yesterday, Palestinian doctors have reported treating dozens of cases of suspected phosphorus burns. According to senior IDF officers, quoted today in the Ha’aretz newspaper, the Israeli military made use of two different types of phosphorus munitions. The first, they insisted, was contained in 155mm artillery shells, and contained “almost no phosphorus” except for a trace to ignite the smoke screen. The second munitions, at the centre of the inquiry by Col Alkalai, are standard phosphorus shells – both 88mm and 120mm – fired from mortars. About 200 of these shells were fired during Israel’s Operation Cast Lead in Gaza, and of these – say the IDF – 180 were fired on Hamas fighters and rocket launch crews in northern Gaza. Alkalai is investigating the circumstances in which the remaining 20 shells were fired, amid compelling evidence on the ground that phosphorus munitions were involved in the attack on a UN warehouse and a UN school. The mortar system is guided by GPS and according to Israel a failure of the targeting system may have been responsible for civilian deaths. However, critics point out the same explanation was used for mis-targeting deaths in Beit Hanoun in Gaza in 2006. The brigade’s officers, however, added that the shells were fired only at places that had been positively identified as sources of enemy fire. The use of phosphorus as an incendiary weapon as it now appears to have been used against Hamas fighters – as opposed to a smoke screen – is covered by the Convention of Certain Conventional Weapons to which Israel in not a signatory. However, Israel also is obliged under the Geneva Conventions and customary international humanitarian law to give due care to protecting the civilian population when deciding on appropriate military targeting and response to hostile fire, particularly in heavily built up areas with a strict prohibition on the use of indiscriminate force. “They obviously could not have gone on denying the use of phosphorus,” Donatella Rovera, Amnesty researcher for Israel and the Occupied Territories, told the Guardian yesterday. “There are still phosphorus wedges burning all over Gaza including at the UN compound and at the school. Amnesty on Monday warned that Israel could be guilty of war crimes, saying the use of the shells in a civilian areas was “clear and undeniable”. Rovera demanded too that Israel produce clear evidence that there were fighters in the areas it says its troops were fired upon when the phosphorus munitions were fired. The admission that the shells may have been used improperly follows yesterday’s demand by the UN secretary general Ban Ki-moon for an investigation into the targeting of UN facilities – including by phosphorus weapons. It also follows the decision by the IDF to protect the names of battalion and brigade commanders who participated in Operation Cast Lead.